“The Broodmother Awaits You.” These foreboding words define Fantasy Flight Game’s newest Adventure Pack in the Haradrim Cycle: Beneath the Sands. I’ve had a chance to play the quest 3 times now (where did all this free time come from?). Is this quest a nail-biting, tension heavy “monster” quest akin to the Alien films, or is it another slogfest running rampant with locations? So what are we doing? For those who may not be up to date on the plot, our Heroes have been going from one unfortunate event to the next a-la Lemony Snicket. From narrowly escaping Umbar, to escaping prison, to… um… escaping Orc pursuers, the Heroes in the Haradrim cycle can’t catch a break. On one of their few breaks, they awake in the middle of the night to discover their allies are being dragged off into the darkness. Is it Orcs? Not a chance. It’s spiders. Of course it is. 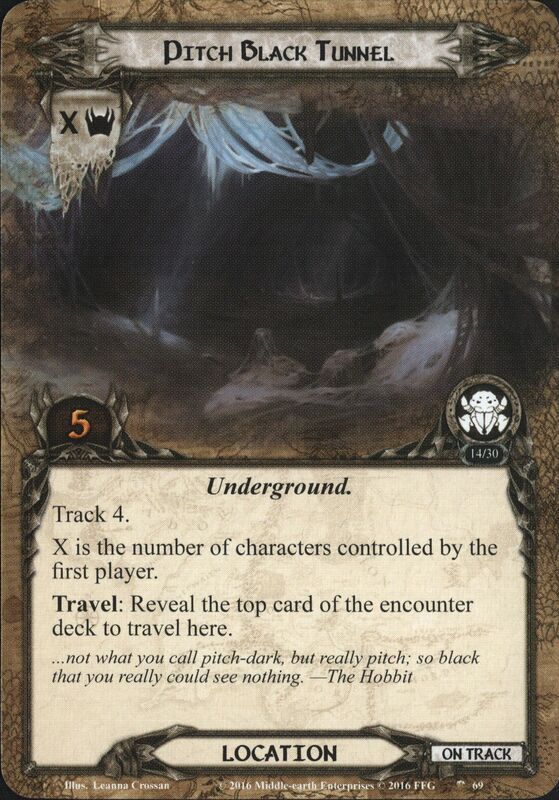 And so our Heroes delve into the tunnels Beneath the Sands (see what I did there?) of Harad. Upon their arrival, they are immediately beset with multiple paths. They know their allies are nearby, but taking the wrong path will lead to more danger… or will it? In Beneath the Sands players will be navigating a series of tunnels, occasionally bumping into creepy-crawlies, and dancing between On-Track and Off-Track in the search for their friends. 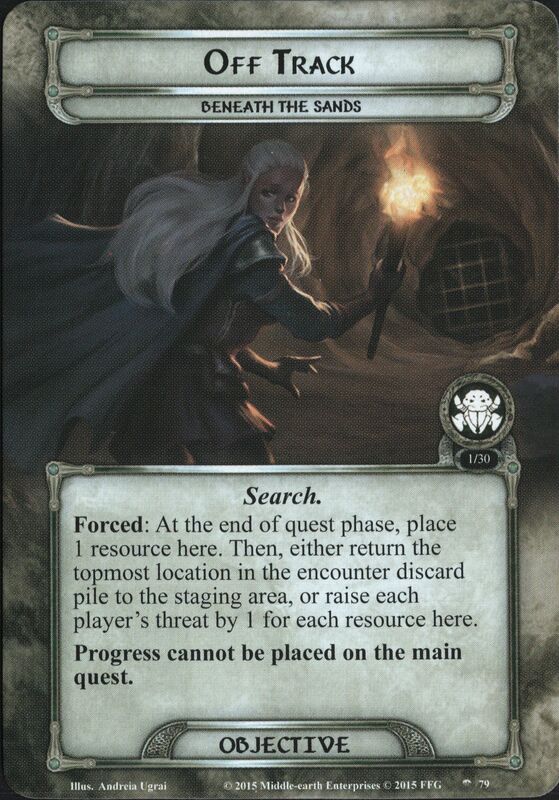 The game starts off with the Search objective on the Off-Track side. Not only does this mean progress can’t be placed on the main quest, but every round players have to either add a new location to the staging area (effectively getting more lost) or raise their threat (I assume this means they decide to stay put and think on it.. wasting precious seconds). After the players quest successfully, they will travel to a location and resolve that location’s Track value. 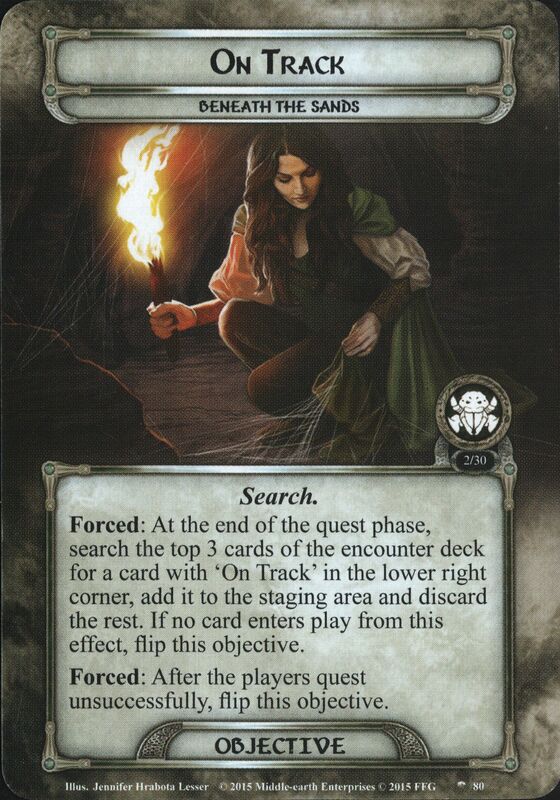 Similar to sailing tests, this requires players to discard from the top of the encounter deck, hoping to find an On-Track keyword in the lower-right corner (see Blocked Passage for an example). If they do they can flip the objective to On-Track and, next turn, actually place progress on the quest (all of which only require 5 progress, which is nice). You would think being On-Track is a good thing, and just staying in that “state” will allow you to cruise to victory, as if there were neon lights directing you to your companions. Well, you would be wrong. While being On-Track does allow players to progress through the scenario, it also brings its own set of nasty-not-niceness (as the Grinch would say). See, though you are going in the “right” direction, said direction also means you are getting closer to the Broodmother and all her ilk. In this vein it is very much like the Alien movies. You’re definitely getting near the end, but the end might also kill you. Some things are manageable, like the Cobwebbed Cavern which gains 2 extra threat. 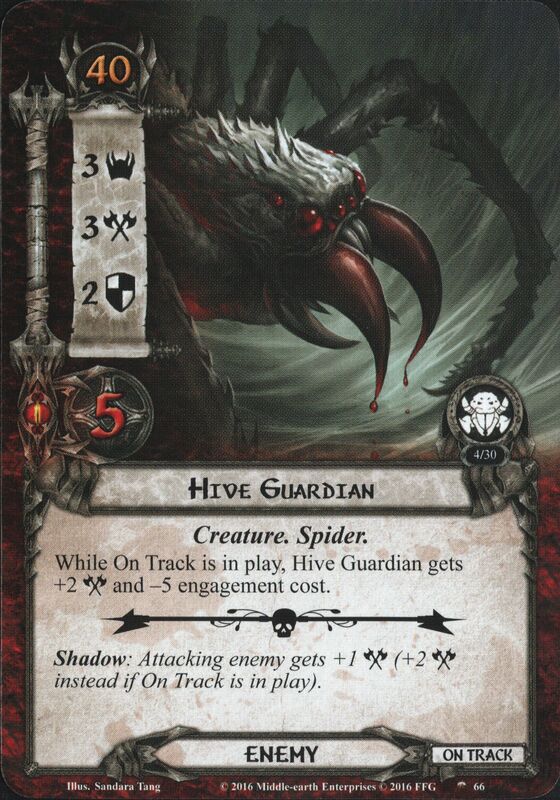 Others, like the terrifically average Hive Guardian gets angrier and stronger when you get closer to its lair. Interestingly enough the game strikes a nice chord in that sometimes your thankful to be On-Track as often as you’re Off-Track if only to avoid horrible triggers. I’m currently on the fence with this quest, and I’ll admit it might be that I have lost all three times. This isn’t necessarily a fault of the quest, as I feel like it has a “solvable” nature to it. Tired of dealing with locations like the Pitch Black Tunnel? Go with an ally-light build and suddenly those previous cards aren’t an issue. Or say screw it and toss in an ally like Ghan-Buri-Ghan that will only benefit from the high threat cost. Enfeebled, while it can certainly screw up your plans in later phases of the round, encourages players to trigger their readying effects proactively. Perhaps my favorite example (because it ruined me twice) of a “solvable” threat in this quest is the seemingly innocent Spider Broodling. Their 2 attack typically stays in that number, as there are few shadow effects that increase the attack total. However, there are 5 Broodlings in this scenario and, if you’re like me, you may find yourself with too few characters as a Broodling is dealt as a shadow, which causes it to attack and get its own shadow, which could be another Broodling, which gets to attack again. A simple solution to these 2-hitpoint nightmares is the tried and true Gondorian Spearman / Spear of the Citadel combo. What really turned the tide against me were the shadow effects. So pack A Burning Brand or bring Erkenbrand or Balin along for the trip and you may have an easier time. The treacheries, on the other hand, can be worked around. In the instance of Injured Companion (from the Core set but featured prominently here as well) you can take the threat hit in the early game, maintain your momentum, and dig for threat reduction later. My only real knock against this quest so far is the chance for it to drag on. While I am generally okay with RNG getting the best of me, it is a bit frustrating when RNG not only hurts you, but delays what you thought was a victory for another round or two. When you are On-Track you still have to perform a similar end of quest effect. Instead of discarding from the top of the encounter deck, you search the top 3 (you also ignore the Track keyword). If an On-Track card(s) is among them, you pick one and add it to the staging area. If not, you go back to being Off-Track. See, while you are Off-Track you engage with a risk-reward system of sorts. The locations with lower Track values (and therefore less likely to get you back On-Track) are easier to get to, while the higher valued ones (with nastier effects) are more likely to help. This comes down to player choice with a dash of push-your-luck. When you’re On-Track the effect just comes down to pure chance, which can be unfortunate. The only way to mitigate this is the Spider Burrow. There are only 2, however, so I wouldn’t make any hard decisions hoping that card will pop up. There you have it! Long story short, this quest has some good, and some not so good. I have been enjoying these Harad quests and their ability to make foes dangerous without sending the numbers into astronomical heights (see the Carrion Bird). And while there is the potential to get location locked in this quest, there are enough tools at our disposals as players that this shouldn’t be an issue. Thematically, this quest is a win (which pretty much rings true throughout the cycle thus far). Again, my only gripe is randomness being out of your control when you are On-Track. As I write this, I think the good far outweighs the bad but I would not recommend playing this with more than 2-players. There is some managing of various triggers that can slog the game down in addition to the Objective delaying the game as well. Cutting down the player count will help. And while RNG can be frustrating and it can make the game drag, there are certainly weak spots that players can exploit if they build appropriately to the quest. Let me know below what you think of Beneath the Sands and whether or not your experiences are similar to mine. A big thanks to Hall of Beorn for having the card scans up so quickly!